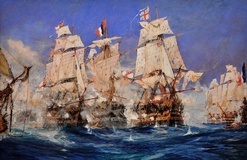 Charles Edward Dixon - Battle of Trafalgar - Online gallery supplying original fine art. Trending Modern British and Contemporary Welsh. Available for sale from Big Sky Fine Art; this original painting by Charles Dixon, dating from 1905.<br> The painting is presented and supplied in a sympathetic contemporary frame, mounted using conservation materials and behind glass. The gouache surfaces in two localized areas have benefitted from professional restoration. The paper medium has been cleaned and conserved to ensure future stability and integrity. All of which took place in early 2016 on our instructions. <br> The painting is signed and dated 1905 lower left. <br> <br> Charles Dixon is recognised as one of the world’s most gifted maritime artists, covering almost every conceivable type of maritime subject. <br> <br> He was born in Goring-on –Thames on 8th December 1872. His father was the genre and historical painter Alfred Dixon, who tutored his son in his development as an artist in his own right. Charles liked to paint contemporary yachting scenes, but also developed a taste for historical naval subjects, painting dramatic naval battles, liners, sail and steamships, and the working boats and sailing ships on the River Thames. <br> <br> He began exhibiting at the age of just sixteen and exhibited at the Royal Academy from 1889, with pictures hanging there most years, and at the New Watercolour Society. In 1990 he was elected a member of the Royal Institute of Painters in Watercolours.<br> <br> Charles soon benefited from commissions from the leading shipping companies of the day, notably P & O. He became a good friend of Sir Thomas Lipton whose grocery stores were so much a part of the English scene at one time, and thus he was allowed to travel with him on each of the five Shamrock boats that Lipton entered for the America’s Cup races. This also gave Dixon the opportunity to paint American naval subjects. <br> <br> Dixon also worked extensively as an illustrator and provided illustrations for the Illustrated London News, Sphere and Graphic. He provided watercolours for all the colour plates in “ Britannia’s Bulwarks”. <br> <br> Watercolour was his favourite medium and Dixon liked to do large paintings very quickly. His fine style, certainly influenced by Turner and Wyllie, has been described as a blend of freedom and accuracy. <br> <br> Like many of the great marine artists Dixon loved the sea and understood its vessels well. He chief recreation was yachting and he was a founder member of the Yacht Club at Itchenor, Sussex, where he lived for many years. He died at home on 12th September 1934.<br> <br> His work is highly sought after today and can be found in many national museums, galleries, and private and corporate collections in the UK, North America and Australia. Many of Dixon’s paintings hang in offices in the City of London. 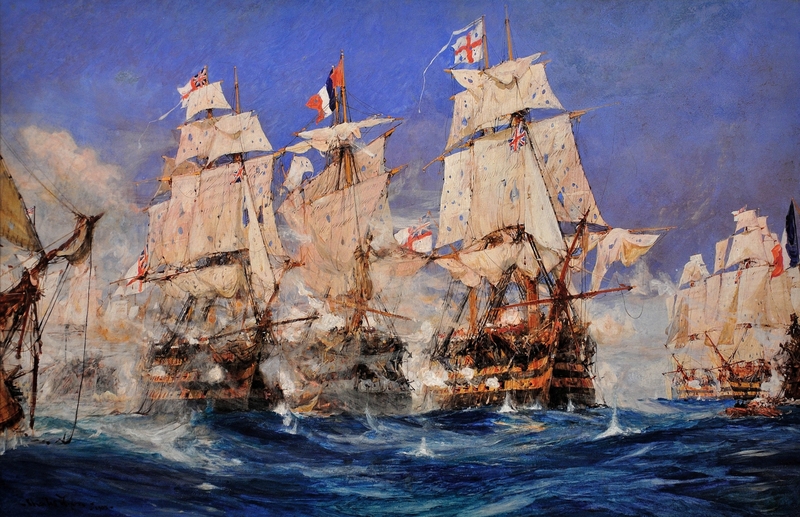 <br> <br> This amazing marine battle watercolor painting depicts a scene from the Battle of Trafalgar, with English battleships displaying the Red Ensign and French battleships displaying the Tricolore. There is gunshot from the cannons, the sails hang from their masts peppered with shot and the sea swells and falls interspersed with gun smoke and smoke from fires onboard. It is intense in both colour and action. Available for sale from Big Sky Fine Art; this original painting by Charles Dixon, dating from 1905. The painting is presented and supplied in a sympathetic contemporary frame, mounted using conservation materials and behind glass. The gouache surfaces in two localized areas have benefitted from professional restoration. The paper medium has been cleaned and conserved to ensure future stability and integrity. All of which took place in early 2016 on our instructions. The painting is signed and dated 1905 lower left. Charles Dixon is recognised as one of the world’s most gifted maritime artists, covering almost every conceivable type of maritime subject. He was born in Goring-on –Thames on 8th December 1872. His father was the genre and historical painter Alfred Dixon, who tutored his son in his development as an artist in his own right. Charles liked to paint contemporary yachting scenes, but also developed a taste for historical naval subjects, painting dramatic naval battles, liners, sail and steamships, and the working boats and sailing ships on the River Thames. He began exhibiting at the age of just sixteen and exhibited at the Royal Academy from 1889, with pictures hanging there most years, and at the New Watercolour Society. In 1990 he was elected a member of the Royal Institute of Painters in Watercolours. Charles soon benefited from commissions from the leading shipping companies of the day, notably P & O. He became a good friend of Sir Thomas Lipton whose grocery stores were so much a part of the English scene at one time, and thus he was allowed to travel with him on each of the five Shamrock boats that Lipton entered for the America’s Cup races. This also gave Dixon the opportunity to paint American naval subjects. Dixon also worked extensively as an illustrator and provided illustrations for the Illustrated London News, Sphere and Graphic. He provided watercolours for all the colour plates in “ Britannia’s Bulwarks”. Watercolour was his favourite medium and Dixon liked to do large paintings very quickly. His fine style, certainly influenced by Turner and Wyllie, has been described as a blend of freedom and accuracy. Like many of the great marine artists Dixon loved the sea and understood its vessels well. He chief recreation was yachting and he was a founder member of the Yacht Club at Itchenor, Sussex, where he lived for many years. He died at home on 12th September 1934. His work is highly sought after today and can be found in many national museums, galleries, and private and corporate collections in the UK, North America and Australia. Many of Dixon’s paintings hang in offices in the City of London. This amazing marine battle watercolor painting depicts a scene from the Battle of Trafalgar, with English battleships displaying the Red Ensign and French battleships displaying the Tricolore. There is gunshot from the cannons, the sails hang from their masts peppered with shot and the sea swells and falls interspersed with gun smoke and smoke from fires onboard. It is intense in both colour and action.